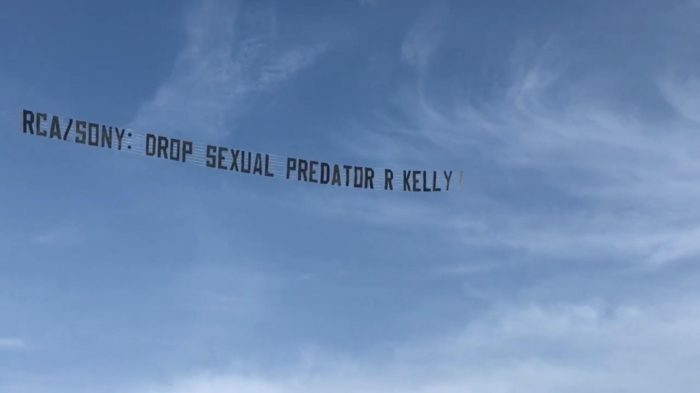 An aircraft flew over Sony Music’s office in Culver City, California towing a sign that read “RCA/Sony: Drop Sexual Predator R. Kelly” on Friday afternoon. The plane, commissioned by the national women’s organization UltraViolet, was intended to further calls for RCA, which is owned by Sony Music and has been affiliated with R Kelly for his entire solo career, to part ways with the singer in the wake of longstanding accusations of sexual misconduct against him, recently detailed in the Lifetime docuseries “Surviving R. Kelly.” In announcing the plane via a statement Thursday, UltraViolet proclaimed solidarity with the #MuteRKelly campaign. Other labels have also weathered criticism and protests over the years for all manner of reasons. In 2010, several hundred Lupe Fiasco fans gathered outside of Atlantic Records’ New York office to demand the release of the rapper’s album, “Lasers.” It prompted then Warner Music chief Lyor Cohen to emerge with the rapper and a boom box and play the new music. Further back in 1992, the release of Body Count’s “Cop Killer” brought Time Warner under fire as law enforcement agencies objected to the song’s release.